Anyway, the product of the day: Tonfas or rather Baton/Nightstick. The Tonfas origin was China and parts of Thailand. The Tonfa like many other weapons today were used as farming tools. 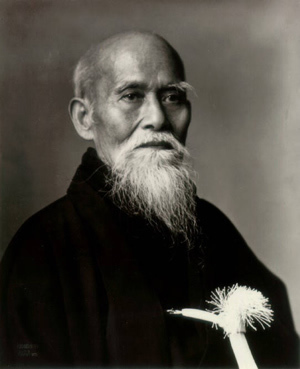 The Tonfa was specifically used to grind rice. 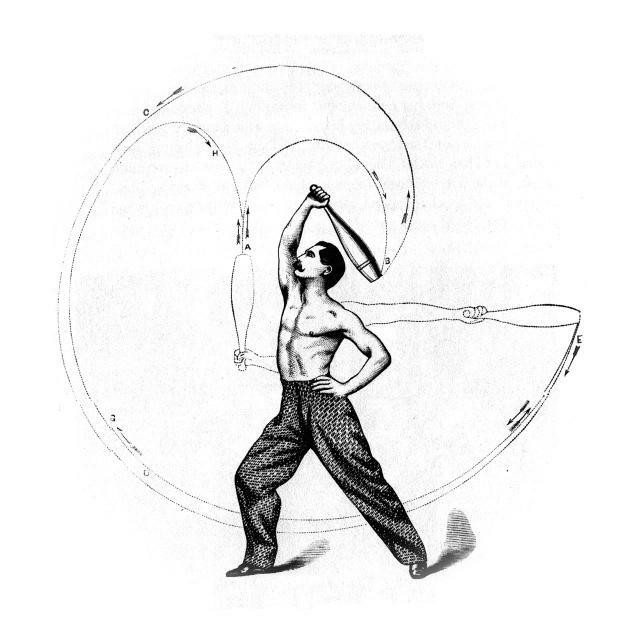 Check out this link for more of the history: Tonfa History . 45-525 Luluku Rd, Kaneohe, HI 96744. 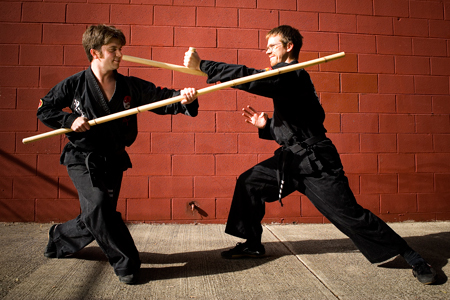 Product of the Day: Foam Escrima Sticks / Batons! Are you looking for a safer way other than sparring and training with real sticks? Maybe our product of the day will help you out: Foam Escrima Sticks. Our Foam Escrima Sticks are 26" long and 1.25" in diameter. The core is sturdy plastic surrounded by a rubber/foam cover. We can also guarantee the cheapest price on the island! KC Martial Arts Supplies is selling them for $5.95 each! Many stores are selling them for $12 and up. If you would like to test the quality please feel free to stop by our store location: 45-525 Luluku Rd, Kaneohe HI 96744. 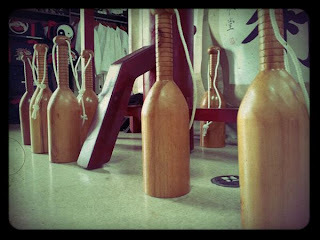 If you are an off island customer you can also purchase them from our web page: www.kcmartialartssupplies.com. If you have any questions please do not hesitate to ask. Aikido: "Becoming one with the universe"
If you are interested in taking Aikodo find a class in your area using onzuka.com. 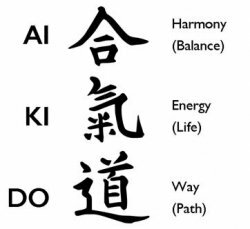 We are official sellers of Aikodo equipment! We carry the Uniforms, Hakama, Jo, and Bokken. If you have any questions please do not hesitate to ask! Thank you for stopping by. Product of the day: Indian Clubs? We also found a plethora of you-tube videos online. We were intrigued by the benefits of Club swinging and decided to make some our very own (first photo). Of course when they arrived we did a test run with one of our employes and here is what he said, "Wow! I can feel the tension across my whole body." After a few exercises he said he felt great. Stop by our local location today and try them out! 45-525 Luluku Rd, Kaneohe HI 96744. How is your week going? Here in Hawaii it flooding but all the waterfalls on the mountains are gorgeous. Paradise is still paradise when its flooding. Anyway, the product of the day is Mouth Guard and Mouth Guard Cases. Our Mouth guards are available in several colors and sizes: JR and SR. We also carry Double Mouth Guards to protect the top and bottom of your mouth. 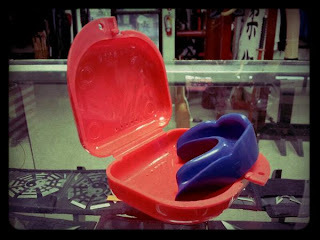 The Mouth Guard case only fits our single mouth guards and are also available in several colors. They are priced at an unbeatable $1.99 for single, $2.49 for double, and $2.99 for the cases! Please do not boil. Some packaging may say to boil the mouth guard but boiling will actually damage the product. 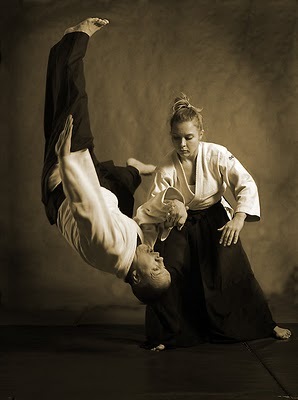 Please call or visits us for the proper technique: 808-486-9002 or email: info@kcmartialartssupplies.com. 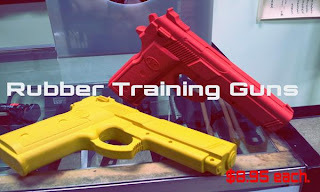 Product of the Day: Rubber Training Guns! How was your Leap Year? Ours was great! 45-525 Luluku Rd. Kaneohe, HI 96744.